Re: Minor but annoying - easy improvements? Minor but annoying - easy improvements? When the user selects a component or feature that is in a group, highlight the name of the group in the model tree! This would save tons of time. I am currently working on Groups right now on a legacy part done years ago and it is truly a pain trying to figure out in the tree where I am. It would also be nice to have the group name highlight in red after a failed feature rebuild for the tree collapses and you cannot see where the failure is either. I am not sure where to leave these comments but this discussion seems appropriate, especially if someone from PTC is watching. Used Thicken of Surface for the first time and what was seen was an extruded surface with a draft included. The additional draft appeared to interfere in the assembly. Days were spent trying various options to investigate/remove draft: change options of Surface and Thicken, cut off draft, add cross sections and datum points to measure interference, etc., to no avail. Finally switched display from Shading w/ Edges to No Hidden and the draft disappeared! At maximum magnification, the surfaces and the picked edges of that surface do not align. Using Pairs Clearance between surfaces: clearance from surface A to B does not equal clearance from B to A. Added multi-line note to a drawing. Each time the file was closed and then opened the note box width shrank and had text past the border. What would have happened if this drawing was sent to a vendor? …a customer? A sketch made with a straight line was redefined to an arc. The straight line still shows up when sketch is picked in the model. Drawing shows straight line overlapped on top of arc. The print preview and paper print shows arc as it is supposed to be. PTC’s solution is to change Entity Display > Smooth Lines > checked, change view to Shaded, then back to No Hidden. I have to do this every time this drawing is opened? Preview of dxf file looks correct w/ arc but actual dxf file has straight line. Can’t send dxf file to vendor. Cross section view display direction cannot be flipped. If you want to see in opposite direction, the view has to be recreated. Why present the flip direction option at all? Made a note with superscript. It looked OK on the screen but when converted to PDF there were additional spaces added. Screen display and Print Preview do not actually preview what is put on paper. 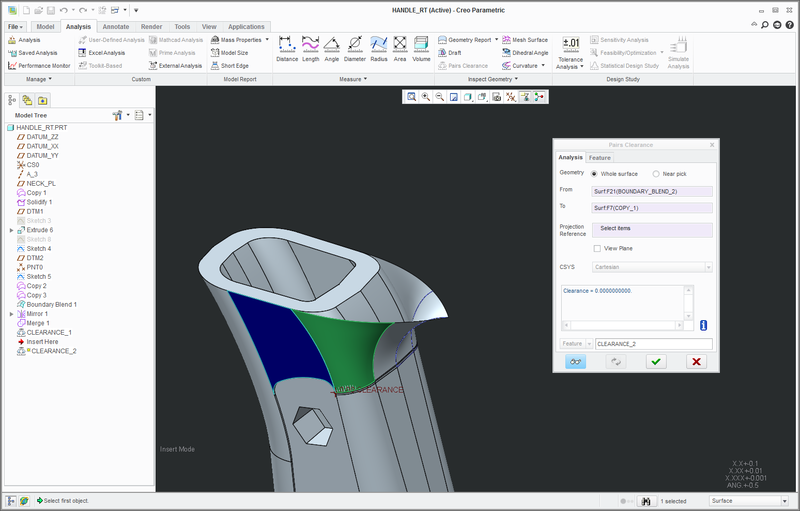 In the current realm of computers dictated by Apple, Adobe, Microsoft, and competitive CAD products, Creo is breaking a fundamental law of computers: WYSIWYG. None of these issues are about complicated or unusual commands that only specialists use. This is basic stuff about believing what you see and do on the screen. Just to make sure I have a good model or drawing it has to be checked multiple times: additional cross sections, datum points/planes made to measure distances, switch between Shaded and No Hidden numerous times, print preview, print and re-print, check exported pdf, check exported dxf, etc. All these points, in addition to points made by others in this discussion thread, leaves me wondering if there are more issues/mistakes/ interferences/quirks I did not catch. Do you have any idea how frustrating and disheartening it is to work with a program you cannot trust? Create a function to jog several (coincident) dimension witness lines together. I believe I might be able to help with some of the issues you're experiencing. I realize this thread is about simple suggestions to make Creo better... but in this case I think some of the problems can be resolved by tweaking some switches. (2) At maximum magnification, edges can appear misaligned. In all CAD systems you'll eventually hit accuracy limits. Some CAD systems simply don't allow you to zoom in enough to SEE those errors. In Creo, you can. You can try increasing the accuracy of your model... but that only helps a little. Tweak your settings for Edge Display and Shade Quality, too. Set your Edge Display to "Very High" and your Shade Quality to 10 for the best possible quality at super high magnifications. You may still be able to zoom so much that the geometry appears to diverge a bit but this is simply the mathematical limits of the tool. Changing the accuracy and the Edge Display and Shade Quality limits will definitely help and allow you to zoom while keeping the geometry more realistic. (3) I can see no reason why a measurement from A to B would be different from B to A unless you're inadvertently picking different references or using a projection reference that's somehow different. Clearance measurements can sometimes be dependent upon the locations you've chosen. Could you take screenshots of the A to B and B to A measurements showing the difference? Sometimes seeing the geometry on screen will provide clues to what's happening. I'd like to investigate this further. (4) This sounds like a word wrap issue I've never seen. Of course, I don't use word wrap! In fact, over my career I've known very few designers to ever use the word wrap feature for notes. Normally we want the text of the note to wrap a certain way. For example, we want the note numbers all to be in a single column while the note aligns to the right. Subsequent lines of text do not begin under the number... but under the text of the note above it. In previous versions of Pro/E, word wrap couldn't accomplish this (perhaps Creo is different). Therefore, instead of using word wrap we've just manually aligned the notes the way we want them... and we never have problems with the size of the note box changing. (5) This sounds like an actual bug. I've never seen this happen in Pro/ENGINEER Wildfire or Creo before. When I redefine a sketch, the old sketch simply goes away. Have you tried recreating the feature completely? Or... replacing the internal sketch with an alternate one created outside of the feature? Alternately, you can try the REPLACE function inside of sketcher to select an existing entity and replace it with a new one (while maintaining all sketch references). Were any of these features suggested by PTC? Also... by chance is the problem feature patterned? I've noticed that sometimes patterns seem to hold on to sketch entities. If the feature is patterned, try removing the pattern, editing the sketch, and then re-patterning to see if this resolves the issue. (7) With PDF you have to be careful. In the print or export settings for your PDF, set the option for Stroke All Fonts to insure your finished PDF exactly matches what you see on the screen. Setting this option should resolve the issue. (8) If this item it related to PDFs at all, see #7. That Stroke All Fonts option really does fix most of these issues. If this isn't a PDF issue, can you explain more? What type of printer are you using... and are you printing using the Microsoft Printer Manager or are you using a custom .pcf file to configure the printers. The difference is that if you're using the Micrsoft Printer Manager, windows is actually controlling the configuration of the printers. If you're using a custom .pcf, this file overrides the windows controls. Please write back and let me know if any of this has been helpful. If you can take screen shots to help investigate some of the other issues, I'll be happy to take a look. In general I find I can trust Creo and other PTC products to function consistently. I may not always love the way certain functions work... but they are fairly consistent. I work for a large employer where standards are paramount. We have to be able to trust our software. Although we'd like refinements and improvements in certain areas, in general we're pleased with the software. Allow "Edit Attachment" of the origin (.000) of Ordinate dimensions in dwg mode. Make the round and chamfer tools more powerful with regards to "transitions" and allow us to truly stop at a surface or extend past a surface. Better 2D capability in dwg mode. The option in sketcher mode to import a complicated 2D sketch from another CAD system with the entities locked (no constraints, dims) and simply allow it to be scaled, mirrored, or rotated. Like an autoCAD block. I've had to emboss some complicated logos and it's a TOTAL pain....and sometimes the cntities change for no reason and I've got to fix things. Don't get me started on Drawing Mode. PTC has owned the answer to drawing mode issues for many years... it's called Medusa and they acquired it from CV(ComputerVision) along with Optegra and a few other things. (1) Ability to sketch a box by clicking two points (corners). I love Creo & Pro/E... but it's 2012... there's no excuse for not having this simple feature. I understand we're encouraging users NOT to sketch entities... but there are times when it's a reasonable request. When? For example... when making SYMBOLS. Which brings me to the second suggestion..
(2) Give us the ability to generate HATCHING in a symbol. Sometimes you need to generate a symbol with cross hatching. To do this now, you have to generate the symbol in drawing mode, add the hatching, then convert the view to draft entities, then copy it into your symbol. Of course, once you've exploded the hatching it only exists as "dumb" lines. You can no longer go back and refine the hatch properties. This is silly... surely allowing the SYMBOL subsystem to access the same hatch functionality as in regular drawing mode shouldn't be a big deal. (3) Give us the ability to snap to lines within the format. When I need to place a new table or symbol and align it to the edge of the format, I have to ZOOOOOOM in like a fool and try to "eyeball" the location of my table/symbol so it appears to be on the edge drawing format. Again... this is 2012... why are we still doing this? As a side note, the "snapping" controls in Creo Schematics (RSD) are perfect. You have the ability to snap to the endpoint or centerpoint of any line, the center of any arc or circle, as well as any arbitrary position along the length of a line. As well you can connect lines using perpendicular or tangent functions. Why are these functions so wonderful? They were included with Medusa (as mentioned earlier)... which is CAD system Creo Schematics is built upon. 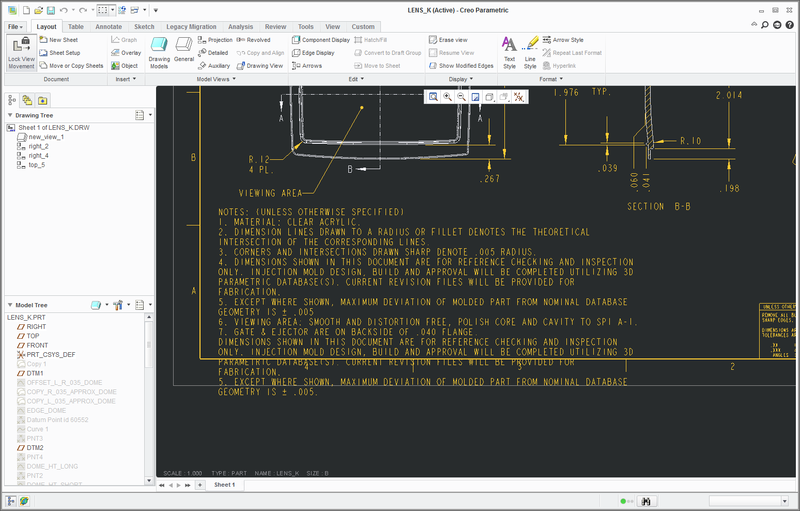 Creo Schematics is a nice package... and it works incredibly well for a package that is essentially built upon technology from the mid 1980's. Maybe we can steal a bit of this retro technology that PTC already owns... and use it in drawing mode? Pro/E could learn a LOT from AutoCAD in it's dwg functions. Making symbols is a pain. Also, why can't we snap to any part of a symbol like you can with A/C blocks? How about a "fill" command for datum curves (I use a super dense hatch for silkscreen work) and symbols? Why are datum targets in dwg mode such a pain? Ive been wanting to create a set of "dumb GD&T symbols for dwgs for years now. I've actually created a few and they make dwgs SO much easier. Like when a datum is already assigned to a dimension etc., but you want to show it elsewhere also. A/C's "inside" or "crossing" spline was awesome too. How about being able to assign entities inside the sketch itself to different layers, not just changing properties (which is in itself an improvement)? For trying to design motion in a datum curve in, say, a skeleton part, how about being able to constrain something to a spline curve or a chain of lines and circles etc.? I'm designing a complex linkage now and if I want to show all the motion, I have to unconstrain something, move it past the radius transition, and then reconstrain it on the next straight line or curve. So, I can't get ALL the motion at once. Yes, I can use Mechanism assembly constraints AFTER I design the parts, but that's after the fact. I can make a "perimeter" consist of a chain, why not be able to constrain to a chain, with stopping endpoints? Did I mention deleting the ribbon in dwg mode? To better manage these suggested improvements to the Creo product, we introduced new functionality to the community platform known as "Ideas." I encourage you all to re-enter (copy/paste to minimize any extra work on your part) your suggestions as Ideas. Just a heads up, this is in beta and only available to PTC maintenance-entitled members. To learn more on how to do this, please view the "How do I submit a new Idea?" document for detailed steps. 2. I have never seen such an issue with other CAD packages where the shaded image does not match the wireframe image. Tech support said this issue started in WF 3 (I think). To your point, the inaccuracies may explain this at the micro scale, however I don’t understand the mismatch at the macro scale (see #1 in my first post). It may be “no big deal” but it adds to a sense that Creo is sloppy. Remember the first Pentium? The screenshot below is at max magnification. The settings are at Edge Display "Very High" and Shade Quality at 10. Notice the surface edge does not match the pre-highlight of edge, which does not match picked edge. 3. The screenshots below show the clearance from surface A to B is 0.0000056457 while B to A is 0.0000000000. First problem is that the issue happens at all; second, it happens inconsistently (I remember one other occasion, but can’t recall where). The value is small but anything other than zero prevents feature completion in Creo. Again, it adds to the sense of unease about Creo. 4. Yes, this is some word wrap issue. There is a work around by adding hard returns and tabs for the hanging indent spaces. It was a surprise to find that what you saved is NOT what you get. A vendor or customer would think I did sloppy work if they saw notes beyond the border. It’s just one more thing to double-check. I have suggested, since the text editor is inadequate in such cases, that Creo should allow the exterior lines of tables to be blanked. Then spacing of multi-line notes can be controlled by a table. 5. It probably is a bug. I did not re-create the sketch, which is a stand-alone feature, because of deadlines, too many child features and parts, etc. Besides, the STP file looked just fine (or was it?). Unfortunately, this issue propagated to the child parts. I will experiment w/ REPLACE in the parent part. PTC did not provide REPLACE as a suggestion. This sketch is not a pattern. Extra wrinkle to this problem is it does not show up on the print preview, paper print, pdf, and dxf seen through Creo. The dxf does show the problem in PTC Express Viewer and eDrawings. 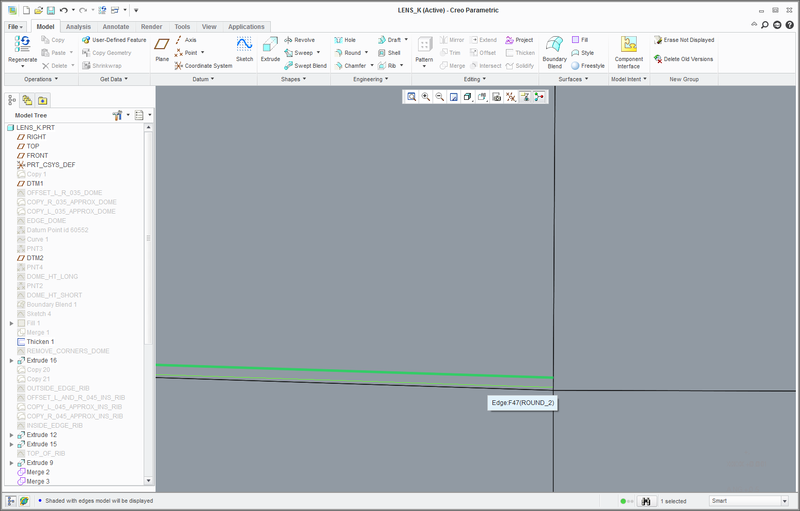 How is it that a dxf file looks different between Creo and Express Viewer? One more thing to double-check. 7. PTC showed me that work around. 8. PTC showed me that work around as well. I print to post script. Apparently Creo does not like MS Print Manager and Xerox ColorQube 9203 working together. Preview was perfect (of course) and on paper was off center, smooth curved lines in preview would have “jags” on paper. I can no longer just glance at a paper print and deem it good. It has to be thoroughly double checked to see if there are any glitches. My issue with Creo is a lack of robustness of core features. Half my time is interrogating the model/drawing from multiple directions. It makes me hesitant to do anything “complicated” because it will be more difficult to verify. We got Creo for the surfacing capability and surfacing in itself is nebulous. I agree that Creo does things oddly sometimes and you just work within those quirks. However, sometimes Creo just gets it wrong and that’s aggravation, time and money. I will muddle through. Again, thanks for all your suggestions.